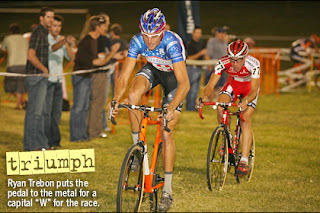 There is fairly good break down of Cross Vegas found here along with some pretty darn good photography of the evening. Chris Grealish deserves some big credit for pulling this off. Abslutley. From what I hear, Chris was implementing 'perfection' out there in Vegas. The course was totally dialed and even after laying out 100's of feet of steel orange fencing....and then having the UCI say "...no fencing! ", Chris rallied and got the whole thing laid out with hours to spare in the most PRO way possible.